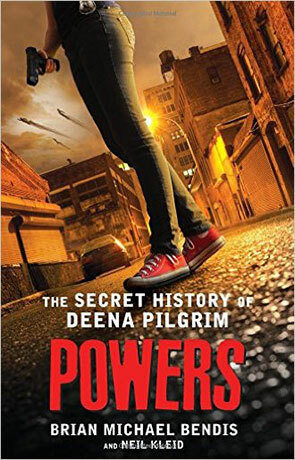 A continuation of the story from the comic books, Powers: The Secret History of Deena Pilgrim is a standalone novel, that links into the comic book story arc. Fans of the Playstation Network TV series may notice a few inconsistencies in terms of the background of its principle character, Deena Pilgrim, but any prior knowledge of this, or the comic book series, does give a clear image of the characters and their world. The novel from Kleid and Bendis doesn’t rely on its visual baggage too much. From the acknowledgements page, you get the sense that Neil Kleid was the main contributor, although the characters were originated by Bendis. The writing is pacey and pithy, invoking comparisons to Jim Butcher’s Dresden Files, with the super hero infused criminal investigation plot. Pilgrim and her partner Christian Walker are now seasoned Powers Division detectives, part of the department that deals with super hero/villain crime. They become personally involved in a serial killer case that drags up skeletons from their individual pasts and sets the city of Atlanta off like a tinderbox. Aside from the occasional head hop, the gritty tone of the writing works well to offset any expectations a reader might have of this book being lightweight owing to its super hero origins. There are vivid descriptions of the crime scenes and the main characters chew up the scenery with each revelation as they all realise someone on the inside and who knows their secrets, must be involved. The angst is perhaps overdone as the writers spend page after page documenting the puzzled agony of Pilgrim and Walker over their grim lives as they firstly, try to solve the crimes, and then try to find ways to deny the solutions that are staring them in the face. In this, the whodunit element of the story is undermined as the field of suspects narrows owing to further murders and lack of thorough police procedural work. The actual investigation elements are kept to a selection of highlights, with the character involvement and development prioritised. The continual reflection overcomplicates what actually isn’t that complicated a plot, meaning the reader is left without a compass. If this is a detective story, there should be more clues to follow. If it’s an urban fantasy, then there needs to be more action. In the final third, Kleid and Bendis make their mind up and settle for the latter theme – urban fantasy injected with superpowers. Again, there’s a Dresden Files comparison in the writing style, but the action description is not as clearly focused as it might be, with the set pieces and placement of characters difficult to visualise at times. There is also some reliance on the previous comic book imagery, which many readers wouldn’t know. It’s here where the lack of novel writing experience shows in our writers as the focus remains on the same things a comic book might focus on, rather what you expect from words doing the work on their own. It’s a subtle difference, but an important one that shows up in the moments when the reader needs the writer to deliver clarity. The perspective of ordinary people confronting the titular ‘Powers’ isn’t played as well as it might be here, with some extraordinary medical recoveries from our main protagonists before they grimly save the day and hang around for the final plot twist. Powers: The Secret History of Deena Pilgrim is a good novel and a safe debut from its writers. There is some baggage to contend with, but that doesn’t make it inaccessible and the book leaves room for further instalments, which you would hope will be a little bit more settled as the writers get used to a new medium. Written on 20th June 2016 by Allen Stroud.